A badly made sentence is a judgment pronounced upon its perpetrator, and even one poor paragraph indelibly stains the soul. The unpleasant consequence of every such botch is that your life, as you register your writing, looks back at you as from a dirty mirror, and there you perceive a record of ineptitude, compromise and failure. This blog is my dirty mirror, and every post a compromise, but I feel some affinity for Gass and his chosen title, Life Sentences, because surely one of its many meanings must be that he has been, as it were, sentenced to sentences, condemned both to appreciate them and to write them, and this, his most recent collection of essays, is a compendium of his appreciations and his unique way of appreciating. 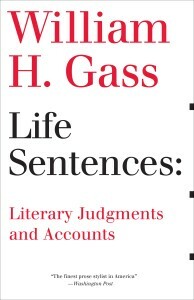 Beginning with a transcript from his acceptance speech for the 2007 Truman Capote Award For Literary Criticism, extending through devotionals to authors as various as Kafka, Nietzsche, Henry James, Katherine Anne Porter and Knut Hamsun, and ending with a microscopic dissection and diagramming of individual sentences, Life Sentences catalogues a lifetime of literary love. Along with hundreds of others, I was once asked by a French newspaper to state, in a word, why I write. I replied in a sentence suitable for a courtroom. I write to indict mankind. I suppose I could have said: I write to convict mankind, but man has already done that without my help, and, besides, I wanted the pun. With acres of their fields burned, crops requisitioned, and farmers enslaved, the population began to starve. Rations, if you were a Pole, came to no more than 669 calories a day. Jews received 184. An officer’s spit might contain that much. Robbers roamed the roads and forests. Diseases spread as the body’s resistance also failed. In France, when Germany overran it, refugees fled one city only to fill another. Friends turned upon friends. Denunciation replaced “bonjour.” So the campaign of extermination was going nicely. The women were the only ones around but nonetheless inviting, exchanging syphilis for a few hundred calories of love. Who could have imagined there were so many Jews; that just removing them to overnight ghettos in Poland or the Ukraine would put such a strain upon every mile of track and every engine’s boilers; that so many departments of government would be required, soldiers to shoot them, munitions to facilitate this, guards to control them, shovels to dig and to cover their graves? Better methods had to be found for both death and disposal. Perhaps those employed with such success in the programs of euthanasia might be brought into play – sealed chambers and car exhaust – and camps built solely for death’s purpose. So thirty gas vans were built in Berlin. They could kill sixty at a time, an improvement of ten over previous model years. Occasionally a child survived whose mother had so severely swaddled it the fumes could not penetrate the cloth. It was a doubtful stroke of luck, since the guards would smash such babies’ heads against convenient trees. In the aesthetically interesting sentence, […] every materiality of language is employed to build a body for the meaning that will realize the union of thought and thing that paradise apparently forgot to promise us, and give consciousness the solid presence it constantly yearns for and will never quite realize. Over and over, we think that in the word we shall find the place where mind and matter meet. Words – simple, everyday words, carefully chosen and dutifully arranged – make possible this miracle, and you need only sample a small handful of his prose to realize that Gass cares more about his every sentence than some writers do about whole books.